Monocacy National Battlefield will be opening a new exhibit that examines the towns ransomed by Confederate General Jubal Early in the summer of 1864. 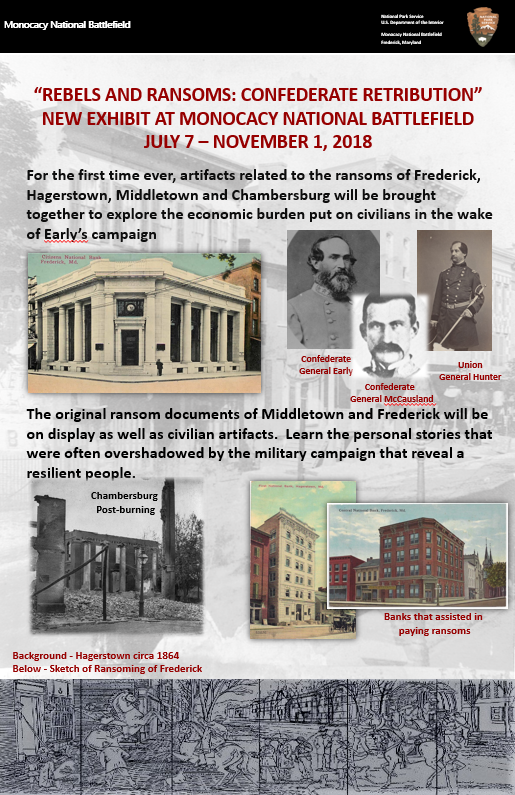 For the first time ever, artifacts related to the ransoms of Frederick, Hagerstown, Middletown and Chambersburg will be brought together to explore the economic burden put on civilians in the wake of Early’s campaign. Created in partnership with the Washington County, Middletown Valley, and Franklin County Historical Societies, the City of Frederick, Heritage Frederick and Main Street Middletown, the exhibit will contain the trunks and baskets that ransom monies were gathered in to be given to the Confederate Army, or in the case of Chambersburg, secreted away. The original ransom documents of Middletown and Frederick will be on display as well as personal items that melted in the fire as a result of Chambersburg’s not paying their ransom. The exhibit will explore some of the more personal stories that are often overshadowed by the military campaign to reveal a resilient people who literally lived in the border between the North and South and had their lives and livelihoods overturned during the Civil War. The exhibit is free to the public and runs from July 7 – November 1, 2018. Bio: The ITPWV.com news desk is happy to receive and publish your local news, tips, press releases, product announcements, business profiles, pictures, and anything else that would be of interest to residents of the Eastern Panhandle or West Virginia. Help Cole Kleppner win a full scholarship to WV Wesleyan - Please vote!